Editor/Author Bradshaw, David and Dettmar, Kevin J. H.
The Companion combines a broad grounding in the essential texts and contexts of the modernist movement with the unique insights of scholars whose careers have been devoted to the study of modernism. 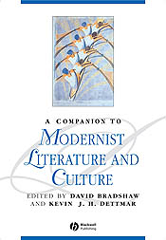 An essential resource for students and teachers of modernist literature and culture. Broad in scope and comprehensive in coverage. Includes contributions from some of the most distinguished modernist scholars on both sides of the Atlantic. Brings together entries on elements of modernist culture, contemporary intellectual and aesthetic movements, and all the genres of modernist writing and art. Features essays on the signal texts of modernist literature, from James Joyce's Ulysses to Zora Neal Hurston's Their Eyes Were Watching God. Pays close attention to both British and American modernism.